Gayna Hansen is one of our beloved “KBS Katz, on our team for 3 years now. Ironically, we had pegged her to be one of our “featured riders” the same week she had her accident. The story that follows is hers. We are posting it in its entirety. On 3/15/16 at 5:30am, I got up to go on my regular training ride like any other day of the week but that time I didn’t come home. I was hit by a car about 5 min from my home. The crash report said my body “flew into the air, made contact with the hood, hit the windshield & came to rest on the pavement.” So many people ask me if it hurt & I honestly did not feel a thing. I woke up on the ground & my first thought was “ah crap.” So many people dear to me flew into action that morning & my crash will always be a trauma to them as well. My name is Gayna Hansen & I’m a 44 year old crazy cyclist that loves pain & still chooses to ride, despite the danger, because this sport & everyone associated with it has given me so much. I’m a Mental Health Therapist who works from home for United Health Care as a specialist on their Autism Care Team. I never lose motivation to train because I love how it makes me feel. Being hit by a car didn’t tarnish that. For me, letting go of something you love for fear of possible death brings on a living one really. So just like a light switch, I turn the fear off. I ride for the camaraderie & friendships, to push my body & mind past limitations, to be an example for my kids, and because I love to eat! At home waiting for me that morning, was my husband Kris who got THE call, my 12 year old daughter Abbi & 9 year old son Alex. To this day, they’re a bit scared about me riding. My whole family & my training partner all dropped what they were doing to help me. Left: The gruesome results of the car impact severed Gayna’s foot. The doctors managed to reattach it successfuly. As a driver, I can say the repercussions of an accident like this are so pervasive for both the victim & driver-emotional, medical, financial, legal, occupational, and more. In an instant of poor focus or impatience everything changes. My foot was pretty much ripped off. I had 3 stitches in my head & I have trauma to my upper back. Right: The sturdy carbon fiber bike wheel was snapped by the impact. Three months of greatly reduced activity & I’m still struggling to get my power & cardio levels back where they were. Mind you, my recovery was at a God given & supercharged pace. The ankle is still messed up but I make it keep up with me. I’ll do my first race on Labor Day-a 40k TT- with the help & support of my coach Patrick Sansbury & KBS Race Team & of course my family & friends. It will be a true test of my recovery. Left: The impact point of the car. Today, almost 6 mo after the accident, I still think of it daily. I ride the same road I got hit on every morning & occasionally I look over my shoulder. I can feel the impact in my ankle with every step & have other lingering issues. “I just didn’t see her,”says the driver. To this, I’m a bit speechless. Although I truly believe, every experience molds us for what’s down the line, the biggies like this do have their losses associated with them. 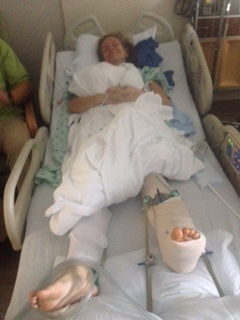 In the OR, I asked if I could still make my race in 3 wks. They laughed at me. The biggest impact was not my ankle, or my bike-although that was super painful, but knowing that my family is scared when I ride and how many family things I have missed in the last few months due to medical issues. Do you know the leprechauns missed our house this year?? Mom was in the trauma unit (wink). On Labor Day 2016, Gayna competed in the 6th Annual Cowbell Classic 40K Time Trial, placed 3rd in her division and set a new personal record. So the next time you’re approaching a cyclist on the road, try to remember that it could be someone you know on that bike. Be aware & give wide clearance. We all have things in life we are passionate about. Let’s work together to make it safer for cyclists to pursue their passion so they return home from every ride.